Only 25% of clothing collected for thrift shops actually sells in the stores. What happens to the rest of it? For anyone who doesn't want their old shirts, pants or dresses to end up in a landfill, clothing donation bins sound like a win-win-win solution: the donor gets to declutter, the charity operating the bin gets to resell the clothing to fund good deeds, and a shopper on a budget gets to buy affordable clothes. But in reality, the path your worn-out jeans take isn't so straight, and doesn't always benefit the people you may think. "It's very difficult to see what's going on," said Kate Bahen, the managing director of Charity Intelligence Canada, an organization that aims to help donors make informed decisions. "It sort of goes into a murky world, and it's difficult to follow up what happens to the clothing — how is the clothing actually helping people, how is it charitable?" Bahen said. Charities including the Society of St. Vincent De Paul, the Salvation Army and Goodwill collect their own donated goods and sell them at their own thrift shops, but only about half of what they collect makes it onto the shelves and racks, and only half of that will actually sell. At the Salvation Army, clothes have four weeks to sell before they're replaced by the next wave of donations, according to Tonny Colyn, the national donations manager in Canada for the charitable organization. Other charities may operate their own donation boxes, but they don't always sell the clothes themselves. The Canadian Diabetes Association and Big Brothers/Big Sisters, for example, contract the sorting and selling of the clothes to for-profit enterprises such as Value Village. Value Village agrees to take the contents of the charities' bins, sight unseen, and pay them a flat fee based on the weight of the load. That fee is negotiated on a case-by-case basis, and is not publicly available. 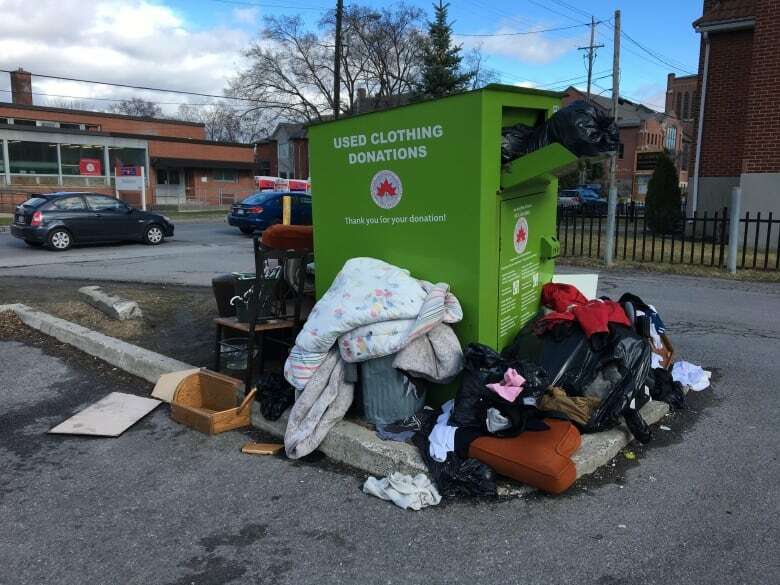 Value Village then sorts the clothes, and — like the charities that do it themselves — only sells about a quarter of it, said the company's VP of Recycling and Reuse, Tony Shumpert. So about three-quarters of the clothing sent to thrift shops fails to find a second home. And some clothing donation bins skip thrift shops altogether. This means about 80 to 90 per cent of donated clothing isn't being resold in Canada. So where does it go? Some use a for-profit broker to find a home for all those unwanted donations. One of the biggest brokers of used clothing in Canada is right here in Ottawa: Bank & Vogue, located off Cyrville Road on Michael Street, moves about 1,000 tonnes of clothing a week from more than 270 charities, mostly in the U.S. The clothes are baled and shipped to reprocessing plants in Toronto or Houston or India to be sorted. Some of the clothing may be repurposed as rags for industrial use. Some is ground down and reprocessed for use as insulation or car-seat filling. And some is sorted and sold overseas to second-hand retailers in countries such as Kenya, which imported close to $21 million in worn clothing from Canada last year, according to Statistics Canada. Bank & Vogue co-founder Steven Bethell, a 49-year-old Ottawa resident, got started in the industry 22 years ago when he worked with the Salvation Army to try to find second and sometimes third lives for unsold garments. Bethell's company aims to find a solution to what he calls "the crisis of stuff." Bethell wears his philosophy on his sleeve, sporting a second-hand vest, scarf and white dress shirt redone with a denim collar. He's helped turn Bank & Vogue into a global business which now employs 300 people, including 50 at the head office in Ottawa, with boutique thrift shops called Beyond Retro in the U.K. and Sweden, and an "upcycling" plant in India that turns old materials into new apparel to be resold. Even in countries that make new clothing, consumers mostly purchase second-hand clothing, Bethell said. But that doesn't mean the quality suffers. "The stores in Guatemala — I think that most people would be really blown away that the stores look like The Bay. You'd walk in and be like, 'This is a used clothing store?'" But critics including Kate Bahen of Charity Intelligence say the problem with moving second-hand clothing to the developing world in that it suppresses the struggling textile industries in those countries and dumps our waste into their landfills. "It has disastrous effects," Bahen said. "People are now looking at countries like Kenya, where the textile industry has been wiped out by our generosity." "I don't think we should be exporting our garbage to developing countries, and I would put donated clothing in pretty much the same bucket," she said. The issue came to a boil in 2016 when a six-country bloc called the East African Community proposed an import ban on used clothing. But some of the countries backed down from the ban after pressure from the United States, which had a trade agreement allowing certain bloc members duty-free access to the U.S. market. Bank & Vogue's Bethell said used clothing is going to places like Africa because merchants there have a market to sell it, and sorters here are only sending clothes they think will sell. "They don't want garbage. They absolutely don't want it," Bethell said. Businesses in Africa, for example, must pay a high tariff on any worn or used clothing they import, Bethell said, adding to the already-thin margins of the retail thrift business. "No rational businessman would ship stuff to East Africa or West Africa or Central America just to have it burn in a field," he said. Elizabeth Cline, author of Overdressed: The Shockingly High Cost of Cheap Fashion, has been to the clothing markets in Nairobi, Kenya, and said the clothes she saw ranged greatly, with some in bad shape and other items "totally fine." Yet however much extra life clothing gets in developing countries, the reality is the textiles themselves usually end their life there. "Textile-to-textile recycling technology doesn't really exist yet. It's in its earliest stages," Cline said. "And add to that the fact that most developing countries don't have even basic collection and recycling programs anyway." So how do people make sure their donations are going where they want them to? Charities like Salvation Army and St. Vincent De Paul say one simple solution is to be more selective about what you donate. The better quality the donation, the more likely it will find a home locally. They also recommend people skip the bins and drop their clothes off directly to the charities during store hours. But charities and for-profits alike say a more lasting solution for people concerned about the fate of waste textiles would be to buy less stuff, or if they do buy, to buy more at thrift shops. That's because donated clothing is just the tip of the iceberg: some 85 per cent of clothing in North America isn't even making it into a bin where it may get a second life, and is instead going directly in a landfill, according to SMART, a group that represents for-profit companies in the recycled textiles industry, including Value Village and Bank & Vogue. Author Elizabeth Cline puts the blame on our own shopping habits. "The consumer is at fault here," Cline said. "We're the ones that are buying too much stuff and then we want our unwanted things to somehow be good for the world. It's really crazy. It doesn't make any sense." Paul Jay is a reporter and producer with CBC Ottawa. You can reach him on Twitter @PaulJayCBC or email him at paul.jay@cbc.ca.